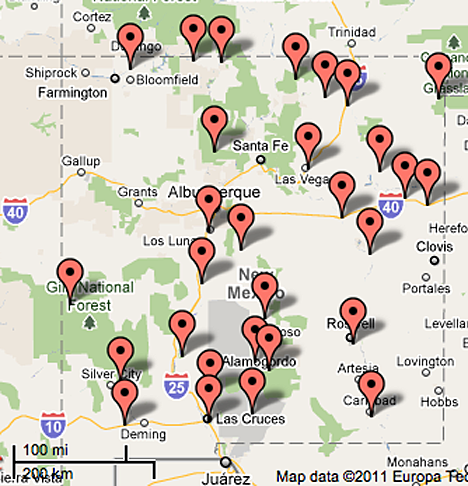 There are 29 USHCN stations in New Mexico, and only one GISS station is on the list, which is in Albuquerque. So we begin by downloading the station data, from the Aztec Ruins to the Tularosa stations . . . . . And then comes the fun of trying to work out what the resident populations around the various stations is equivalent to. Bell Ranch, for example, does not appear in the citi-data set, and a quick scan around some of the other sites I have used for small populations doesn’t help either. 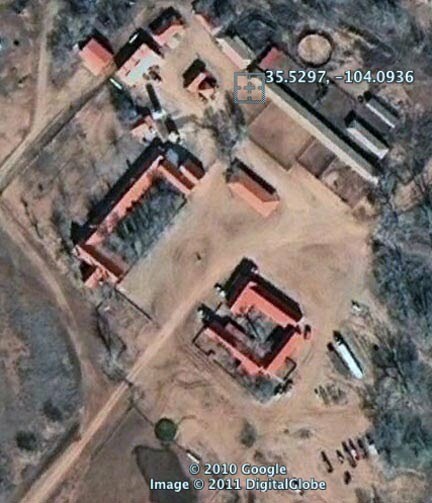 But when I go to Google Earth there appears to be quite a community around the station – somewhat like a small college I would guess. Unless the long sheds are something like a chicken farm?? Maybe I will use an initial population of 50 and move on. 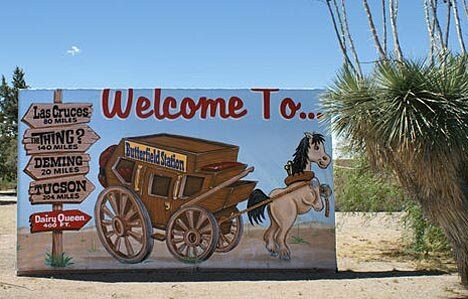 I had to use (Zip-codes.com to find that Fort Bayard had a population of 188. Gage is reported to be a ghost town, but the station sits right next to I-10 and there is a restaurant there (a Dairy Queen I believe). The traffic and the concrete is bound to have some effect, but how much? Jordana is an Agricultural Research station, the equivalent of a small farm, with about a dozen buildings – say 40 folk. I had to use Zip-codes for Luna, similarly with Mountain Park, and the station is half-way between it and High Rolls. Orogrande is south of Alamogordo, and unincorporated. And the State University site is in Las Cruces. So having got the city data, the basic geography for the state is that it is 370 miles long and 343 miles wide. 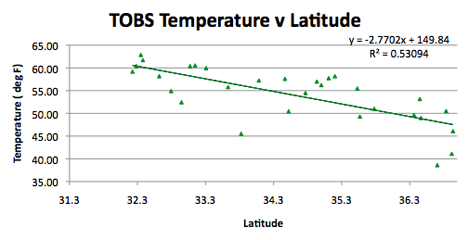 It runs from 103 – 109 deg W, and 31.3 to 37 deg N in latitude. 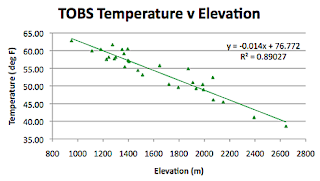 Average elevation is 1,737 m (the average station elevation is 1,599 m, and the GISS station is the lowest of any of the stations at 952 m.
That location alone might serve to explain part of the 2.61 deg F higher temperature on average at the GISS station, relative to the homogenized USHCN data. 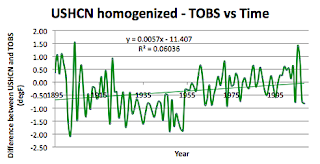 Turning to the TOBS (time of observation corrected) data, since this has not been homogenized and blended, for the rest of the plots. 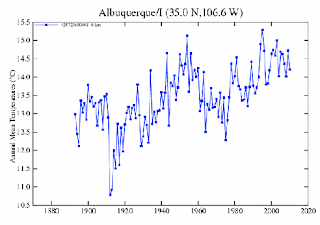 It can be seen that the temperature rise per century, averaged over the state, is around half a degree F, somewhat less than the 1.1 degrees of the homogenized record, or the 2.7 degree F/century of the GISS station. The state clearly shows the effect of Latitude, though there maybe some interaction with elevation driving the correlation. 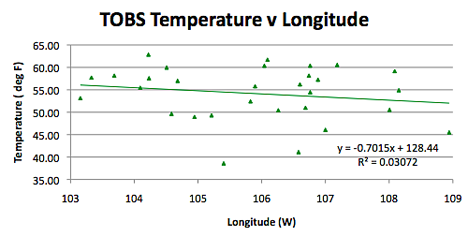 There is no correlation with Longitude. However the usual clear correlation with elevation is present. I need to plot coefficients with location at some stage, since I suspect this will give some more useful information (state to state). Which leaves the population, and again with this being a sparsely populated state around most of the stations, and just one or two large conurbations, it is not possible, likely because of the geographical influences, to see much correlation. HO -- Something odd. 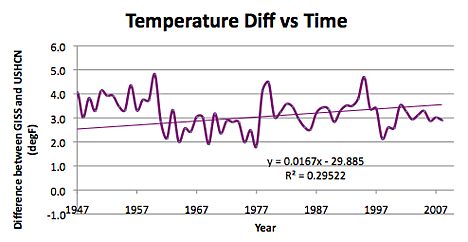 The second graph (titled "Temperature Diff vs Time") visually shows an apparent declining trend from 1947 to 2008/09. Yet the linear trend fitted to it has a positive slope. Why? This time (unlike the data from a number of other states), temperature decline with elevation seems to approximate the adiabatic lapse rate. Since New Mexico temperatures obey the laws of physics, why don't temperatures in other states? I guess because that is what the numbers say. 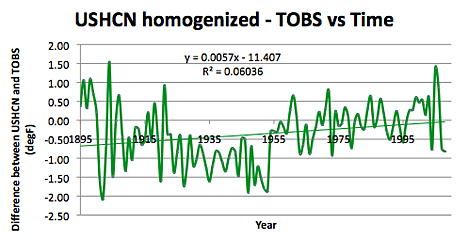 I went back and looked, and I had included the Albuquerque station in the TOBS average (using the GISS values). So I took it out and replotted. The difference is really insignificant with averaging over this many stations, and the data still shows virtually the same inclination (it changes from 0.46 to 0.48 degrees per century). 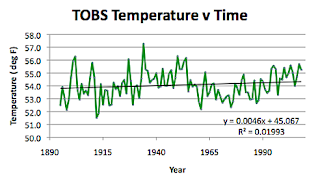 It is a very small degree of warming, because of the drop in temperatures in the middle that you note, but the temperatures, on average, 115 years ago were about half a degree less - difficult to see on this scale. 115 years ago? That may explain the anomalous positive slope of the graph. 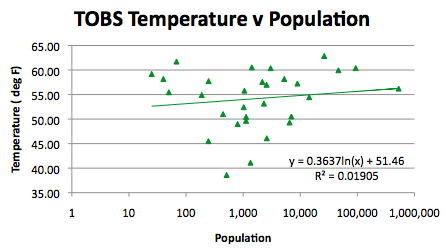 The trend may be fitted to data not shown. The Temperature Diff vs Time graph starts in 1947 -- only about 60 years of data rather than 115 years. 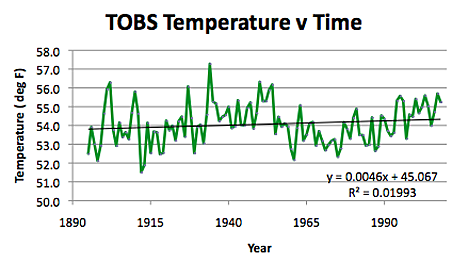 This may illustrate the issue shown on many temperature plots -- temperatures oscillate on decades-long cycles. Depending on the time selected for the start, a trend may seem to be be up, down, or flat.